Luxor Times: Good news for Egypt. A new discovery in Tell Basta. A red granite statue of Ramses II was discovered to the east of Goddess Bastet temple in Tell Basta, 85 km from Cairo by the German-Egyptian mission working in the site. The statue is 195cm height and 160cm width showing Ramses II standing between Hathor and Ptah. 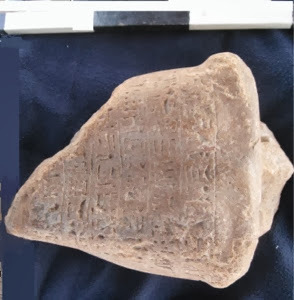 Dr. Mohamed Ibrahim said "The importance of this discovery that it could lead to discovering a whole temple." 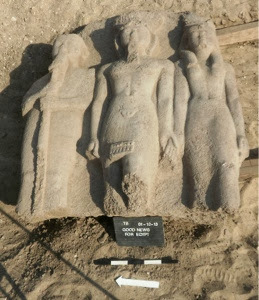 The mission also discovered a statue of a high official of the 19th dynasty. The limestone statue of 35cm height and 25cm width. The hieroglyphics inscriptions on the back refers that it was presented to Goddesses Sekhmet and Bastet. Both statues were moved to the open museum in Tell Basta. 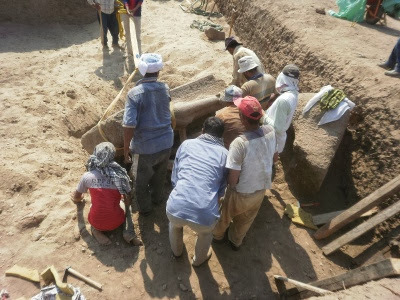 How amazing that they uncovered ancient Ramses at the Tell Basta site in Egypt as this place used to be called Pithom, which is mentioned in the bible in Exodus 1.11 as the place the Hebrews were forced as slaves to build a temple for Ramses 11. Evidence of the place uncovered.